Nothing says “Game Over” for the Xbox One experience like an overloaded hard drive. 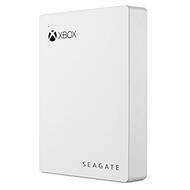 Boost your console’s storage capacity with the Seagate® Game Drive for Xbox, the only external drive designed exclusively for Xbox. In a portable drive that fits in your pocket, you can store your current game collection and downloadable content - with tons of space left over your next most anticipated games.